Kettering Town will travel to Vanamara National League side Aldershot Town in the fourth qualifying round of the Emirates FA Cup. The Poppies earned their place in the draw for the final qualifying round, which was made at Wembley Stadium today (Monday), thanks to a 4-0 victory over Hednesford Town at Latimer Park at the weekend. 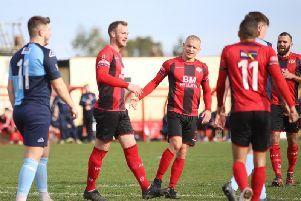 But Marcus Law’s team will now have to come through a tough test if they are to progress to the first round proper as they head to Hampshire to take on an Aldershot side who sit in 18th place in the National League. The tie will be played on Saturday, October 20 with the winners receiving £25,000 in prize money and a place alongside the Sky Bet League One and League Two sides in the first round draw.